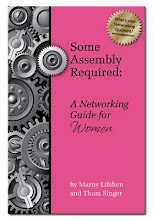 March 1, 2010 is the official release date for my newest book, "Some Assembly Required: A Networking Guide for Real Estate". Co-written with top real estate entrepreneur Chad Goldwasser, this is the third book in the Some Assembly Required series. If you are a Real Estate Professional, or know someone who works in real estate.... be sure to buy this book on Amazon.com or at the Goldwasser Institute Bookstore. Interview on Will Dearman's "The Strategy Blog"
A while back I sat down with Will Dearman from "The Strategy Blog" for an interview. I knew Will when he lived in Austin, TX. He is now based in New York City. Three Days Left On Our February Fundraiser For "The Kate Singer Endowment for Cranio-Facial Surgery and Research"
Thank you to everyone who participated in the 3rd Annual fundraiser for Dell Children's Hosptial. We have found this is a great way to celebrate Kate's birthday each year, as our family knows how fortunate we are to have come through the issues with Kate's head eight years ago. We appreciate the support from the readers of this blog and the donations from $5 to $100 that were made to this cause. We raised $1020 (so far... three days left to donate!!!) for research for cranio-facial abnormalities. If you tried to donate and had issues.... feel free to try again. The Dell Children's Medical Foundation fixed the glitches in the program on their donation website.... so it now should be easier to make a donation. I had heard from several people that you had tried to donate, but could not. Four of Austin's top organizations that support the entrepreneurial community (Entrepreneurs Organization, EO Accelerator, ATI, and CTAN) co-hosted an event to bring their members together on Tuesday night. Not even the "Blizzard of 2010" could stop entrepreneurs from showing up to network and listen to local business leader Jack McDonald (it had snowed three inches that day -- A lot by Austin standards, ...... and when it snows in Austin, everything else shuts down) . I have written about my friend Jack McDonald in the past. Last year he had formed and exploratory committee to look at running for Congress. In the end, he did not run this time around. The chances of his winning as a Democrat in the Republican district (against a well funded incumbent) did not add up. As a real businessman, he made the informed decision to not make the run (a real politician would have run anyway, wastefully spending $3 million of donor money. A good entrepreneur does not waste cash - A politician will wast money any day of the week). Jack's talk centered on "How To Grow Your Business In A Tough Economy", something he knows a lot about, having lead a successful public technology company (Perficient, Inc. - PRFT) over the past ten years. Austin (and Texas) have been fortunate in this recession. We have several companies that are adding jobs (example: entrepreneur Brett Hurt's Bazaarvoice has grown from zero to 400 jobs over the past four years), and the city's young workforce is among the best educated in the world. The diverse and open culture coupled with other positives in the region means we have what it takes to grow. Both individual businesses and Central Texas are poised for expansion in 2010 and beyond. But Austin cannot be complacent. There is a lot of other cities who are positioning themselves for growth in tech, bio-tech, energy and the other industries. We are not immune to the challenges of the recession or the future and we must continue to take actions to make the region successful. The Austin business community must reinvent to stay ahead of the curve. McDonald challenged the audience of entrepreneurs not to sit on the sidelines, but to instead be involved in the process. The Austin Chamber of Commerce and other organizations are working on the plans for the future through policy, business recruitment and retention, and other business ecosystem investments. However, the tech entrepreneurial companies are often not at the table, because many of these companies are customer focused (and their customers are around the world, not in Austin). He reminded the crowd that their success is directly tied to the city's future. 1. Do not chase "easy revenue". Know who you are and who you want your clients to be. He witnessed may of Perficient's competitors disappear because they chased the Dot-Com economy in the late 1990s. 2. Avoid ego driven expenditures. By keeping fixed costs low, a company can survive the tough times. Too many small businesses obsess over Class A office space (Class B office space is just fine for a growth company!) and other expenses in order to "look bigger". This can be a fast track to going out of business. 3. Be realistic. After the tech crash in 2001 too many entrepreneurs and investors stuck their head in the sand, when they should have moved fast to make changes to get lean. The end of his talk touched on national politics. The global economy has a lot of competition, and it is not going away. Our federal government must make policy adjustments to keep the country on the right track. The tax code on small businesses is neither effective or fair. Big corporate welfare is not driving job creation. GE, who is not adding jobs pays around 12% in taxes while growth oriented companies pay close to 40%. (Huh? That is nuts. Are you listening in Washington DC?). 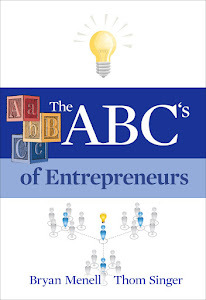 America's secret weapon is entrepreneurs. Washington must recognize this and make decisions that encourages capital formation and supports those who start and grow companies. We have one of the highest corporate tax rates in the world, and this puts America at a disadvantage. It is a shame that Jack will not be going to Congress. We need more people in Washington DC and in state governments who are entrepreneurs. Our elected officials are often good people who went from law school to politics without ever having met a payroll, created a job, or developed a product or service. They have no clue about business, but are the ones making the decisions that effect not just Wall Street, but Main Street. Overall it was a great event, and I would like to thank the four hosting organizations and sponsor, Frost Bank, for making it happen. I am enjoying my involvement in EO Accelerator, as the organization continues to expose me to great people and educational programs that help me in my own journey as an entrepreneur. This video clip is from an interview FOX on a recent trip to Ohio. None of us hit the ground in our careers fully baked. In fact, I believe that few people are ever even done at all. It takes time to fine tune the skills and instincts that allow us to make an impact, and if one is not open to growing, they stall out. I meet a lot of professionals who try to put on the facade that they have figured it all out and are somehow superior to those around them. An early "homerun" in their career (because of talent or luck) can cause a person to believe their own press and thus never allowing themselves to grow to even higher levels. When ordering the chocolate souffle at a fancy restaurant, you must plan ahead, make your order in advance and relish the time it takes to prepare. Success is not the pre-packaged cheesecake where you can pour on some fruit puree to hide the flaws. Real success has bumps, cracks and a gooey center. I am on a journey toward higher levels of my career. It took me until I was over forty-years-old to have the confidence, experience and understanding necessary to take my own path. I am very fortunate as I am now living my dream, but I am far from completion in figuring out this recipe of life. This does not bother me, as I know that with each ingredient I advance in how I can help others through my work. I am losing patience with people who put on fronts that pretend they are so damn smart. It is in our vulnerabilities that we expose our brilliance. The people who are overly proud of themselves and caught up in their own importance are less attractive than their inflated egos lead them to believe. Those who view the crowd around them as adoring fans are the fools. Other people do not exist to be scaffolding, but instead to be our co-workers in building greatness. All opportunities come from people, thus we need as mutually beneficial peers if we really want to reach the highest heights. Climbing up and over others can get you to the top, but leave you alone on a hill instead of together on a mountain. Sharing with others that you are a work in progress will lend them to be more open to being of assistance to you as you grow your own path. Do not just look to those higher than you, although most will give you a hand up, but look side to side and find the ones with whom you can co-create, as that is how deep relationships are forged. 1 in 1500 children are born with cranio-facial abnormalities. Our daughter was one of them. Kate was born with with Saggital Synostosis in 2002. She underwent surgery to re-shape her skull when she was six months old. Today she is eight years old and doing great. Three years ago we started the "Kate Singer Endowment for Cranio-Facial Surgery and Research" at Dell Children's Hospital of Central Texas. We donate 5% of the speaking fees I receive as a professional speaker to this cause. In February, to celebrate Kate's birthday, we ask the readers of this blog to join us in raising money for this cause. Any amount helps the doctors discover new ways to treat children born with issues similar to what Kate faced. So far this year we have raised $1015.oo in donations ranging from $5 to $100. Would you please join us in trying to meet our February goal of $2000.00? DONATE NOW!! I had the honor today of attending the first TEDx Austin event. Nearly 300 people filled the Austin City Limits studio to listen to thought leaders, economists, technologists, scientists, inventors, philanthropists, poets, artists and entrepreneurs share their wisdom. The theme was "Play Big" and the day was certainly a cross-training work out for the mind. Some of the speakers sparked me think hard and explore several aspects of the navigation of my own path. The conference was a full day of good ideas and pontifications sprinkled with some nuggets of brilliance. It was an inspiring experience and simultaneously left me expecting more. There had been a lot of secrecy in the organization and around who was to speak on the program at the event, which lead many to expect some giant surprise appearances were in store. While there were no surprises, it was still a good day (especially for a first time event). A big "THANK YOU" to the speakers: Rip Esselstyn, Doug Ulman, Steven Tomlinson, Chris Muller, Chris Shipley, Bill Merrell, Carrie Conte, Mark Rolston, Janet Maykus, Turk & Christy Pipkin, Bob Hunt, Richard Garriott, John Phillip Santos, Phillip Berber and Mark McKinnon who all gave from their souls to make TEDxAustin a success. There was a thread that wove through the presentations and that was "humanity". From mapping the human genome to fighting disease to finding ways to help people around the world.... we are all connected. From the food we eat to exploring our ancestry to discovering the stars, we are all at the same family table in business and in life. In closing, organizer Nancy Giordano stated "Today is not the end, but the beginning", as they have already begun the plans for TEDxAustin 2011. I look forward to seeing how this program progresses into the future. I have partnered with the Austin Business Journal for a series of business seminars over the past year. Several hundred people have attended the "Smart Series" presentations since June 2009. At each event the ABJ offers a special price to those who subscribe to the paper while present at the event. They offer one, two and three year specials on subscriptions. The Austin Business Journal is a great resource for anyone who does business in Austin, and it is very cost effective. For $86 for one year or $182 for three years (special price) you get the weekly paper, online access, and the Book of Lists. 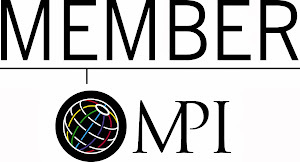 Plus they host a variety of educational, networking and awards programs every year that bring together the "Whose Who" of the Austin, Texas business community. This is an easy product for me to endorse, as I read it every week. (Full disclosure, I do receive compensation for my partnership with the ABJ... but I have been actively utilizing the value of the paper for over 15 years). Now that same offer they offer at the seminars is available to anyone who reads my blog. My-Oh-My, What A Jaded Marketing World We Live In!!!! 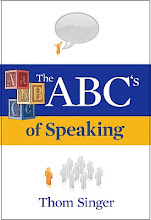 My new book "The ABC's of Speaking", which has gotten a lot of attention this week after a great story in Monday's Austin American-Statesman, is now available as a downloadable iPhone App. We had just put up "Batteries Not Included" last week, and more of the New Year Publishing titles are on the way. Our iPhone developer accidentally listed the price as "FREE" for the small book of public speaking tips. While it is our intent to charge for the book, we decided to announce on Twitter that the book was temporarily available at no charge. It should take about 24 hours for it to update, so we figured we would share the book with those who wanted to act fast. It was funny how many people accused me of a "marketing stunt". The immediate reaction was that there was no mistake made by a developer, but instead this was a New Year Publishing ploy to promote the new book. My-Oh-My, what a jaded marketing world we live in nowadays. In the online social media world everyone thinks that people have an angle everytime something happens. Can't things just be what they appear to be? In this case we saw that the book was listed for free and decided to tell everyone who follows me on Twitter to let them grab the book while they had the chance. I would rather people read my books, blogs, and other pontifications.... even if they do so without paying me any money (Now, do not get me wrong... I like, respect and appreciate everyone who buys a book!). 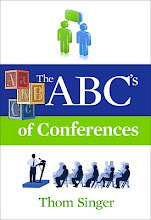 Not sure when the price point will kick in, but if you search "ABCs of Speaking" in the App Store you will find the book. Enjoy! CLICK HERE to read the article in Monday's paper. There have been a lot of articles lately about how to get noticed by influencers, how to raise your value to those in your business community, and how to stand out from the crowd. Times have been tough and competition fierce, and people are looking for any edge to help them achieve more. Think of your own life. If you are successful you probably have people who want to get on your calendar to "pick your brain". Too many such calls and you feel you have no brain left. Thus you hide from all the calls from friends of friends who seek your counsel. But what about the person who refers you a new client? Will you meet with them? I bet you will. Getting the attention of the movers and shakers is easier than you think. You just need to know what people want in life and then bring it to them. You find out what they want by asking them. Questions like "what do you need to make 2010 a spectacular success?" or "who is your ideal client and how do you find them?" or "If I could do one thing to make your life better, what would that be?". Now, you will not be able to help everyone. Your network of contacts and powers of influence do not lend themselves to every person's needs. But if you ask enough people, you will find ways to become a conduit for success for many people. And do you know what happens to those who are conduits for the success of others? They become magnets for success. Opportunities line up at their door. This happens for two reasons. One is karma. Those who do good just seem to find more good things. The other reason is that you are always being watched in your community (business and personal). People know who those people are who assist others and they want to be in their orbit. You know how they get into their orbit? They help them achieve their goals. Yep, it is a continuous loop. It is not always the people you help who help you, so do not keep score. Too often I have seen people give up because they have delivered great things to folks and those folks have not returned the gesture. This causes people to sour on the whole idea of being generous. They take a "self-focused" stance and miss out on all that could have come their way. Zig Ziglar, famous author and speaker, said "You will get all you want in life if you help enough other people get what they want". He is right. Speaking AT SXSW or Another Conference? I was interviewed by Austin American-Statesman reporter Sarah Beckham for an article that appears in today's Life & Arts section. With Austin's SXSW conference only a month away, there are hundreds of speakers and panelists from the local area (and beyond) who are preparing to present at the music, film and interactive conferences. Not everyone is a professional speaker, or even experienced on the stage. Many are subject experts who are not comfortable or confident in public speaking. 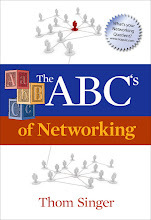 My new book, The ABC's of Speaking is a great resource for anyone who has to stand up before a crowd. Sarah's article does a great job of sharing these ideas for would-be speakers. CLICK HERE to read her article in today's paper. The Austin Tech Happy Hour has become a "MUST ATTEND" event. If you have never been... you should check it out this month's special gathering at Buffalo Billiards on Thursday, February 18th. 5:30 PM - 8:00 PM. If you CLICK HERE you can get your tickets for a discounted price for the readers of The Some Assembly Required Blog ($5.00 instead of $7.50...you save $2.50). This month is a special event around the Sprint 4G Network. When the Austin Tech Happy Hour organizers, Bryan and Angi Menell, heard that Sprint was rolling out 4G service in Austin, they knew it was something that everyone would want to check out. For years people have been talking about how great WiMax was going to be, and now it’s finally here. For more about the neat things you can do with this technology, check out the story on AustinStartup. They thought the best way to let you see, feel, and touch how cool this stuff is was to throw a happy hour with Sprint as quick as they could put one together. They’re going to have various demonstration stations available to show you how it all works, and what a dramatic difference 4G can make in your work and recreational lives. "Too Busy To Network" Might Equal "Too Busy for Future Business"
I often hear from lawyers, accountants, bankers and other professionals that they are "Too Busy To Network". They rationalize that serving today's clients should take 100% of their attention, and that they are only judged in their firms by today's numbers. However, most of these professionals also agree that the biggest clients they served in 2009 are not the same biggest clients from 2005. Life happens: companies get bought and sold, businesses fail, turn-over causes new execs to bring in their own vendors, etc.... Also, even if they keep the clients, their needs can fluctuate from year to year. Because of this, you need to think about tomorrow or you could find yourself without enough business in the future to keep your doors open. 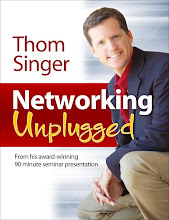 Networking is not about "schmoozing" or attending meetings while passing out business cards. Networking is about cultivating long-term and mutually beneficial relationships throughout your business community and the industries you service. It is about building a personal and professional brand that helps you make the short lists when prospects are seeking your products and services. Out of sight is out of mind. If you think that you are admired for the hard work you are doing behind closed doors you have an inflated opinion of yourself. Nobody is paying any attention. If you are not "out there" in your business community, then you are invisible. There is too much competition and an overload of "noise" out on the street for you to be on the radar if you are not actively cultivating relationships. Every year I coach a few professionals on how to raise their visibility inside and outside their firms to help grow their brand. It is an eight week program that involves five meetings (one every two weeks) in person or by phone. There is homework between the meetings (for the client and for me! ), but mainly the goal of the program is to help the professionals better understand the importance of their networking, community involvement, branding, and creating of a mutually beneficial referral network. I am currently looking for only two lawyers or other professionals to work with between now and the end of April (after mid-April my speaking calendar heats up and I will be traveling too much to do any coaching until the summertime). If this interests you, please contact me by email or phone. I am a big fan of the iPhone. I got mine last summer and have often proclaimed publicly that the iPhone is the greatest invention in the history of the world (my wife still believes that honor goes to fire or the wheel.... whatever, she does not yet have an iPhone,). I was not sure at first that my phone would have a ton of "Apps", as I was unsure of the purpose of most of the ones I saw my friends downloading. Now I have those same ones I thought were silly. Today I was lost trying to find the location of my San Antonio lunchtime speech, and the iPhone got me back on track. I told the kids that daddy's iPhone was not a toy, and that we would not be downloading games. Well that lasted a week... now it is full of games! 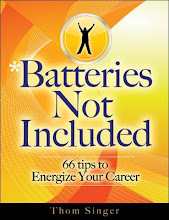 But today I want to tell you that my book, "Batteries Not Included: 66 Tips To Energize Your Career" is now available in the Apple Store as a fully downloadable app. Just search "Batteries Not Included", and for $2.99 you will have all the tips from the book right on your phone. It will even bookmark your place so when you return to read more you can pick up where you left off. It is fun to have my book on the iPhone. I hope you will check it out. More books coming in this format very soon!!! Value is more important than ever. The economy of the past year and a half has taken its toll on everyone, and people are still gun shy about hiring new vendors. Across industry lines people are skeptical of spending money without knowing what they will get for a return. I personally do not mind spending money if it helps my business expand over the long run, but I hate feeling like I over spent for a product or service.... or that only the vendor won in the exchange. If they do not want to cultivate a friendship beyond sending me a bill, I am not sure that they have my best interests at heart. I find that businesses that hire speakers for conferences are the same way. As I talk with meeting planners, sales managers, and others who are in charge of finding motivational speakers, they are looking for the value beyond the stage time. These professionals do not mind paying the speaking fee, but they want to be sure that the speaker does not just show up, speak, and leave. They want the speaker to be engaged in the whole conference: attending dinners, happy hours, eating meals with the attendees, and helping out where they can make an impact. For me this is great. I always want to participate in my client's event. It is through meeting the people in the audience and engaging in conversations that I am able to customize my presentations on the fly. At a conference last weekend I re-wrote the last ten minutes of my presentation by quoting other speakers, board members and panelist who spoke earlier in the conference. I also added photos from the conference into my PowerPoint and shared stories of experiences that I witnessed attendees having at the resort (and how this added to their own networking experiences in bonding with each other). We were at The Atlantis Resort in The Bahamas, and I watched several of the people go on the huge "Leap of Faith" water slide (or chicken out at the last second! ), and these stories added direct value to my presentation beyond just showing up and delivering a canned talk for my assigned 90 minutes. On the flip side, I currently work with a vendor who never adds value beyond the services that I have paid for in my contract. It is frustrating, as I want to be able to refer vendors who go beyond just being a service provider. I want those with whom I do business to be part of my extended network. It is hard to become a referral source for those who do not see the relationship as "win/win". No added value means you are not creating the bonds that lead people to become your advocates. Sure, people are busy, but in today's digital age you cannot forget that the person on the other side is a human being with feelings. You must appeal to their soul if you want them to see you as more than just someone they pay for a service. Busy is never an excuse to forget the importance of making others feel special. Doing good work is just the ticket to allow you to play in the game. If you take pride in the fact that your company gives what you promise, quit patting yourself on the back. You must go farther if you want to deliver value. I find that value is often in the little things. 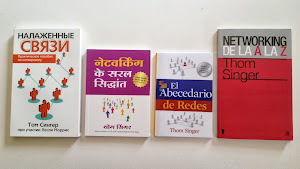 I read a lot of business books, but review few of them here on my blog. The reason for this is that few of them stand out from the pack. I just finished reading "The Six Pixels of Separation" by Mitch Joel. There are several books on social media floating around right now, and I have read many, but this book was an above average informative piece. Mitch Joel is the "Rock Star of Digital Media" (according to Marketing Magazine), and the president of Twist Image. His credentials aside, he wrote a book that can inform the novice while still making those with social media experience sit up and think about the topic. I love the dedication to his family in the front of the book which begins with "Cells before Pixels", reminding us all that there is still the human element that outweighs the buzz about the digital age. If you are looking for a book about this topic, I recommend this one. Today is Kate's 8th birthday. Please help us celebrate by making a small donation to our third annual fundraiser for the "Kate Singer Endowment for Cranio-Facial Surgery and Research"
We established this endowment several years ago to assist local doctors with their efforts to treat children born with cranio-facial abnormalities. It has been 7 1/2 years since Kate's surgery for Sagittal Synostosis. We were very fortunate, which is why we donate 5% of the money that I earn from speaking fees. I know that the recession has made times tough, and world events take a lot of priority for giving, but 1 in 1500 children are born with cranio-facial issues. Any amount you can donate goes a long way. $5, $10, $25, or $100 can make a difference. Thanks for your support. CLICK HERE TO DONATE. I Sat Next To A Hero! On a recent flight from Atlanta to Nassau the flight attendant announced that they were looking for a doctor or nurse to attend to an ill passenger at the front of the plane. We were less than an hour into the two hour flight. The gentleman next to me, Clint Turley from Virginia, leaped over me like a surly jackrabbit and ran toward first class. I has spoken with Clint earlier in the flight, and he is an Emergency Medical Technician, and when duty called he did not hesitate. He went into "EMT Mode" and went to help. I had never been on a plane that had to make a medical emergency landing. They soon announced that we were putting down in Jacksonville, FL. Kudos to the flight crew, as they had that plane on the ground fast. The pressure in my inner-ear was the evidence that this was not your regular landing. Everyone on that Delta flight did what they had to do during this unfortunate incident. Clint and a nurse stayed with the ill man until they helped the paramedics get him onto the ambulance that was waiting on the tarmac. Apparently he was fine. They had thought maybe a heart attack, but then did not think it was that serious. I appreciate that there are people like Clint to jump in to help on a moments notice. We were 90 minutes late getting to our final destination, but it is things like this that make you realize that late flights do not matter in the big scope of the world. I hope the man in the front of the plane is okay. Clint and his wife were on their way to a relaxing week in The Bahamas, I hope that the rest of their vacation was calm, fun and involved drinks with little paper umbrellas. The flight was enough excitement for one trip! FOLLOW UP: Three days later while walking through the Marina Village at the Atlantis Resort I passed a restaurant with outdoor seating, and there was Clint and his wife Leslie eating with their friends and family. Small world! I stopped and talked with them about our airplane experience and the nice time we all were having in The Bahamas. They are really nice people and I was glad to see they were having such a nice trip. I told them I wrote about Clint on my blog... I hope they come by and see this post! The February "Some Assembly Required Newsletter" went out by email today. If you did not receive the newsletter and would like to view it.... Click Here.